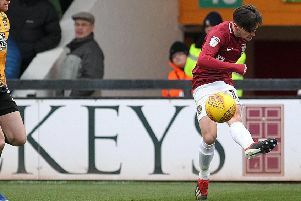 David Cornell has challenged his Cobblers team-mates to ‘do a Carlisle’ and fire themselves up the Sky Bet League Two table. Ahead of their 3-0 defeat at the PTS Academy Stadium last weekend, the Cumbrians had gone on a six-match winning streak that saw them rise from mid-table to promotion contenders. The Cobblers’ win over Carlisle was only their second in 13 matches, but Cornell believes the team is capable of putting together a string of victories to get Town ‘where we want to be’. On the face of it, Town have a great chance to get a run going as they travel to 20th-placed Cambridge United on Saturday, before entertaining 21st-placed Morecambe next weekend. “There are 19 games to go and loads of points to play for, so I don’t see why we can’t go and win the next five or six games, just as Carlisle did,” said Cornell. “If we do that then all of a sudden we are in a position where we are looking at the top 10, and then we are not far off it. “We have to take it day by day and keep working hard, and we have to concentrate on Cambridge on Saturday. Saturday’s clash at the Abbey Stadium will be the third time the Cobblers and Cambridge have met this season. The league meeting between the sides at the PTS in August ended in a 2-2 draw, with former Cobblers midfielder Gary Deegan scoring a late equaliser for the U’s, while the Checkatrade Trophy second round clash in December ended 1-1. Town went on to win that tie in a penalty shootout, but Cornell says neither of those games will have any bearing on this weekend’s clash, especially as Cambridge have a new manager in former Cobblers boss Colin Calderwood. The U’s have won three of their past five games under the Scot, and last Saturday were 1-0 winners at rock-bottom Notts County to keep them just four points behind the Cobblers. “They have won their last two, so it is going to be a tough game.